Yoke for FlightGear (FGYoke) is a virtual yoke app based on TCP for iOS and Android. iOS version available in Apple Appstore. Go to the setting page, and type in the IP address and the port number of the computer that is going to run FlightGear. In this case, we can use 23333 as the port number. Click Save. Type in --generic=socket,in,20,,23333,tcp,from_fgyoke in settings when launching FlightGear. Start FlightGear, and click on the switch in the app. If it stays on "On" position, then the connection was successful. 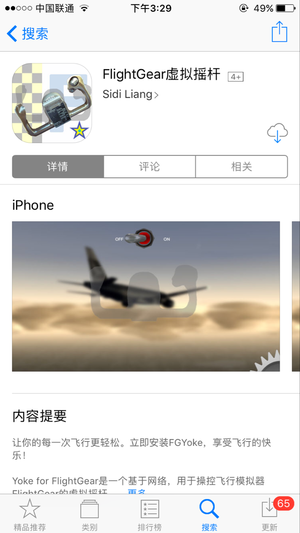 Yoke for FlightGear on Apple App Store. This page was last modified on 20 March 2019, at 10:36.